Leading the Breakers, from left, Cal Nielson, Luc LaMontagne, Ayrton Svenson, Penn Nielson, Tim Andrews, Ryan Whitlock, and Drake Butler. Photo by Coach Scott Witkop. 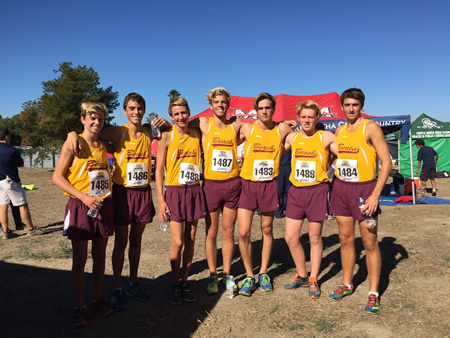 Laguna Beach High School’s boys cross country team took fifth place during C.I.F. prelims in Riverside Saturday, Nov. 14., qualifying for C.I.F. finals for the 12th straight year. They will complete for a C.I.F title and a chance to qualify for the state meet this Saturday, Nov. 21, at Mt. San Antonio College in Walnut.